It's been a long time coming! 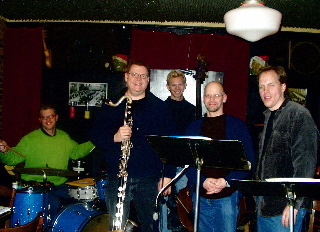 More than six years after Child's Play was recorded, Bruce & I got together with Jim Ridl on piano and Eric Halvorson on drums to knock out an entire all original CD in one day at Peter Karl Studios in Brooklyn. Ironically, Jim (JimRidl.com) grew up in our home town of Dickinson, North Dakota, though I actually just met him a few years ago at Birdland after hearing his duo with Pat Martino as part of the JVC Jazz Festival. He performs and records with his own group and also plays regularly with Dave Liebman and many others. Eric (EricHalvorson.com) has been one of my closest friends for over twenty years. We met and first played together at the University of Iowa. Eric is in heavy demand and keeps very busy in the NYC music scene. 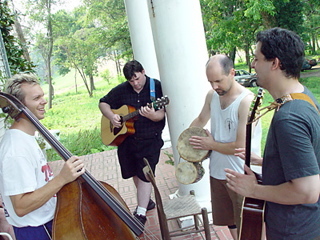 Put your preconceptions to the side, Yucca Flats is like no acoustic rock band you've heard. 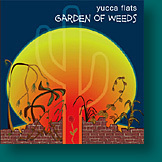 The Counting Crows or Dave Matthews are a reference point, but neither capture Yucca Flats' quirky eloquence. New York to the core, their perfectly-crafted songs have an enrapturing power that ranges from acid social commentary to just plain stomping fun. Lead singer, rhythm guitarist, and harp player Larry Sansone is armed with an affecting growl and perfect falsetto. 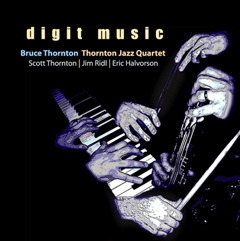 Plucked or bowed, Scott Thornton rocks like no upright bassist you ever heard (even on trumpet). He locks like a boa with a smokin' ex-metalhead guitarist(Wilkins) and a powerhouse drummer(Helmuth) using his suitcase as a kick-drum. Guitarist Mike Murray and bassist Scott Thornton engage in a thoughtful set of duos that consist of six improvisations, two compositions by Murray ("Points" and "Excerpt #4") and an adaptation of Charles Ives' "Soliloquy". Murray plays both acoustic and electric guitars and he uses electronics to augment his guitar work. Murray doesn't just use them to wow the listner with whiz-bang effects, but mainly to vary his tone from a brittle staccato attack to lush reverberating string work (particularly noticeable is the way he lets chords linger toward the end of the first improvisation). Thornton's bass has a big, woody tone and he plays his instrument with a forceful intensity. His arco work really stands out. On "Points" his low, dolorous lines complement Murray nicely from the arpeggiated opening to the harmonics that conclude the piece. The general tenor of these duets is one of thoughtful interplay. They're two players who seem to know each other well and are listening intently to each other. As the title suggests, the music ebbs and flows with swirls and eddies. Liquify is an engaging listen. "The sound approached a haunting beauty... compelling... when your feeling in the mood for some chaotic free playing it's worth a spin." say's Cadence Magazine.